CEMETERY INDEX – This index contains information on approximately 3,500 cemeteries within Saskatchewan. The information has been compiled by the Saskatchewan Genealogical Society and supplemented with information from the Registrar of Cemeteries, Ministry of Justice, Saskatchewan, as well as land reference from Information Services Corporation. This index will continue to be active and new information added to it on a regular basis. OPERATING YOUR SMALL CEMETERY, A Primer for Saskatchewan Cemeteries – This primer commissioned by the Western Canada Cemeteries Association, under the supervision of Ralph Katzman, and distributed by Financial and Consumer Affairs Authority of Saskatchewan provides useful information in the operation of small active cemeteries. 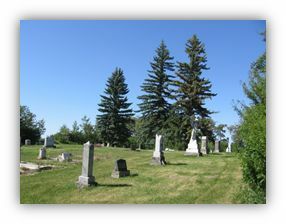 SASKATCHEWAN HISTORIC CEMETERY PRESERVATION GUIDE – This guide provides information on the repair, maintenance and care of historic cemeteries throughout Saskatchewan. The guide has been adapted in large part from the State of Michigan Historic Cemeteries Preservation Guide with permission to reproduce and publish their content and from the Ontario Landscapes of Memories, A Guide for Conserving Historic Cemeteries, Repairing Tombstones, with permission to reproduce and public.